the community used over and over again. common characteristic or interest living together within a larger society”. characteristic or interest, the T1D community. portion of Georgia and are all sitting on the edges of their chair to help us meet our goal. information so she can personally deliver it. She said her friend “needs this” opportunity. 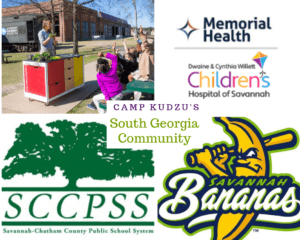 a community where life with T1D is without limitations – everywhere Kudzu grows. children/teens living with type 1 diabetes. I look forward to meeting you all y’all very soon! Cyndi Satlow csatlow@campkudzu.org; (912) 244-4101. Don’t forget the Waycross Family Camp registration is now open!